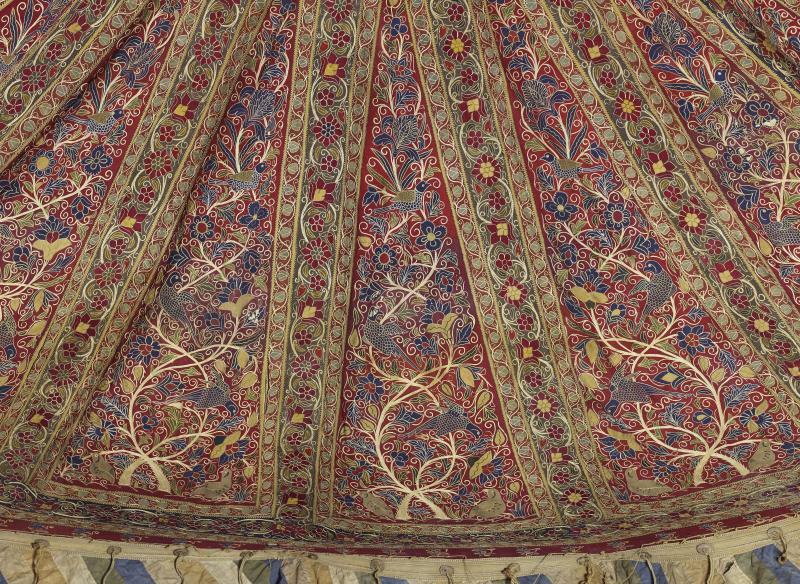 The Cleveland Museum of Art has acquired a royal Persian tent from the 19th Century. A prize acquisition by the Cleveland Museum of Art provides a rare glimpse into a lesser-known aspect of the history and culture of the Middle East: the opulent lives of its monarchs. In today's State of the Arts, WKSU's Vivian Goodman peers inside a royal Persian tent. 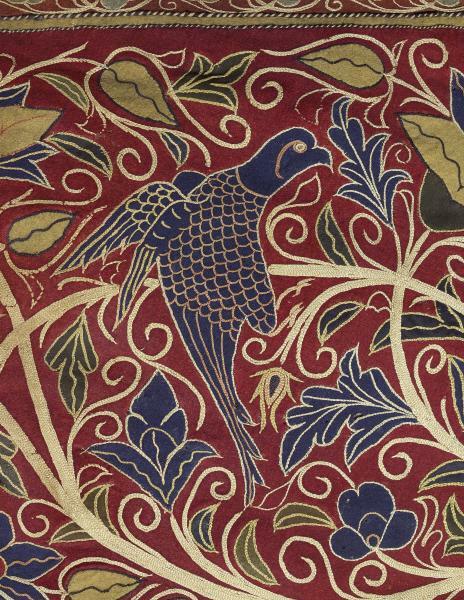 Louise Mackie is the curator of textiles and Islamic art at the Cleveland Museum of Art. She recently pulled off quite a coup. She made the rare find of a royal Persian tent. 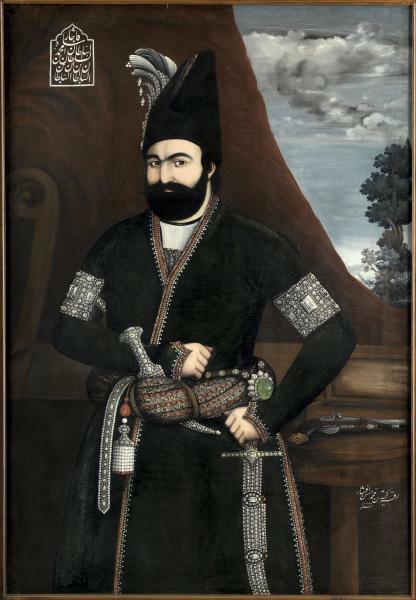 The silk trade made the Shah fabulously wealthy. His portrait, with diamonds on his armbands and emeralds on his sword and dagger, hangs in the museum’s textile gallery next to this magnificent tent, one of thousands he owned. It’s made of wool, 12 feet high and 13 feet in diameter, with a plain red cotton exterior that shows some wear and tear. But the elaborately decorated wool interior, every inch of it covered in silk thread embroidery, is remarkably intact. Soft lighting brings out the colors, in many shades of green, red, tan, ivory, royal blue and pale yellow. Wooden struts that held up the tent centuries ago are long gone, so the museum created a metal cantilevered framework. Support cables and peripheral guy lines are hidden from view. You see recurring motifs of game birds and flowers blanketing the wall panels. Embroidered pheasants and partridges are perched on branches and posed beside vases filled with leaves and blossoms. The intricacy of the stitching dazzles museum visitor Jan Terradotter. 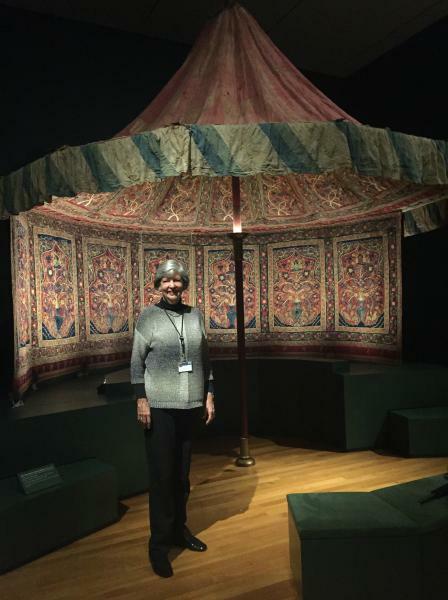 Curator Mackie says the Shah probably used this round one-pole tent for entertaining guests. But beyond their utility, Mackie says tents were also an important part of Islamic art and culture. Rulers would take out dozens of larger tents at a time for ceremonies, for surveying their properties, and for military campaigns. Mackie says it’s highly unusual for an American art museum to obtain a tent like this one. She discovered the tent by chance. She’d phoned a London dealer to inquire about 19th century Persian textiles. It came from Rasht, a major silk-trade center on Iran's Caspian Sea coast. Mackie says tents of this style are rarely seen. It’s a prize acquisition as a work of art, but Mackie also sees it as a bridge to understanding. Visitors Jane and Kevin Payne came from Peninsula for what turned out to be a thought-provoking experience. “Really amazingly beautiful,” says Jane. Muhammad Shah’s royal Persian tent remains on view at the Cleveland Museum of Art until the end of June.